If you want to live a happy financial life there’s an incredible amount of information available on the Internet that could help. One post we saw recently listed the 55 Best Finance Blogs for 2016. If there are 55 best finance blogs, you have to wonder how many there are in total. A number of these blogs tackle specific subjects such as investing or budgeting but many of them cover personal finance in general. Then there are all the software programs and apps available to help you manage your money such as mint.com, PersonalCapital.com, You Need A Budget, Goodbudget, Money Monitor and literally dozens of others. The first thing you need to know about personal finance is how much money you actually earn. The easiest way to know this is by looking at your paycheck or the amount direct deposited into your checking account. Sadly enough this will be a lot less than your salary. The reason for this is that your employer is required by our government to withhold money from your pay for your Social Security contribution. Then there are those darned Federal, state and city income taxes. There’s not much you can do about Social Security withholding and some of those taxes. But if you received a large income tax refund this past year you might change your withholding so that you get more money in each paycheck. Of course, the downside to this is that you will get a much smaller tax return next April. Incidentally, it’s pretty easy to change your withholding as all you need to do is fill in a new Form W-4. The second simple thing to have a happy financial life is to learn to save and invest your money. This is a case where time is your friend. The earlier you begin saving and investing the more money you will have when you’re ready to retire. Don’t feel badly if all you can afford to save is $25 or $50 out of each paycheck. The important thing is to get started. If you’re like most Americans and have a problem saving money there’s a simple answer to this, too. If your employer offers a 401(k) sign up for it. You will definitely want to do this if your employer provides matching funds as this is basically free money. You will never see the money that’s deposited in your 401(k) because it will be done so automatically. You may miss that money but only for a few months. After that you’ll probably have forgotten all about it. If your employer does not offer a 401(k) you should start either a traditional or Roth IRA. You could fund either of these by automatic transfers – the same as with the 401(k). It’s important to also have both short- and long-term goals. It’s hard to save money in the abstract – just for the sake of saving money – but it’s much easier if you have a goal in mind such as a two-week vacation in Hawaii or a college education for your kids. Third, for a happy financial life you need to take steps to protect yourself and your family. One way to do this is by building an emergency fund. This would be to cover those unexpected crises of life such as an illness, unemployment or a major automobile repair. 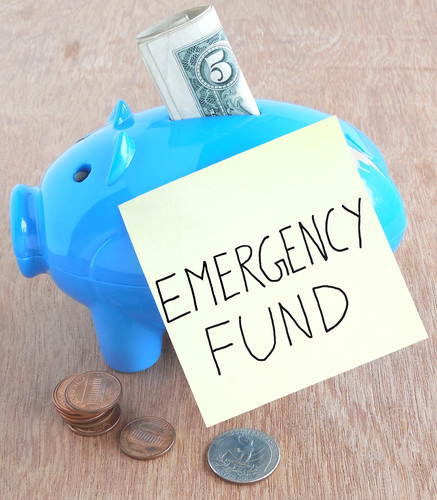 Most experts feel that at the minimum you should have $1000 in an emergency fund but, of course, the more the better. If you’re married and have children, you definitely need to get life insurance. The best choice here is term insurance because it offers high limits at low cost. For example, the insurance company AIG says you can get $250,000 of term life coverage for as little as $14 a month. That’s just $168 a year – a small price to pay to know that if anything happens to you your family won’t suffer. We assume you have automobile insurance but you might want to look into disability insurance. This insurance may cost you no more than 1% of your gross income but could pay 80% of your net income over the life of the policy. There are two types of this insurance. They are short- and long-term. Short-term policies generally provide benefits for up to 104 weeks while a long-term policy may pay you for as many as five years or up to age 65. Of course, the longer the benefit period the higher the premium you will pay. The fourth key to having a happy financial life is also very simple – live within your means. A simple way to do this is to set the maximum amount of money you will spend each week or each pay period and then stick to it. You may have to track your spending for a few weeks to determine what that amount should be. As noted earlier in this article there are a variety of smart phone apps available that can make doing this easy. Do comparison shopping before buying a big-ticket item and don’t let coupons or special offers woo you into buying things you don’t really need. Never forget that money spent is money you will never have again. So think wisely before buying anything costing more than $40 or $50. This is the area that gets tricky because unless you’re part of the affluent 1% there will be times when you will be required to borrow money – in the form of a credit card or personal loan. When you borrow money, be sure to treat the debt sensibly, whether it’s via a credit card or auto loan, it can help you build your credit and your credit score. However, credit cards can be an especially slippery slope. If you do use one make sure to pay off your entire balance at the end of the month. If you need a loan shop around for it just as you would a major appliance. Compare the terms and interest rates of several lenders and choose the one that best fits your finances.